VOXXLIFE – ANTHONY AQUAN-ASSEE, M.Ed., B.Ed., B.Sc. This is a twenty-first century solution to socks and insoles that provide users with increased energy, strength, balance, and flexibility. These socks and insoles are designed by chiropractic neurologists and reflexologists. The socks and insoles will help the user with foot, heel or knee pain they are experiencing. These products also help the user by increasing their energy and flexibility and improving their strength and balance. There are NO comparable products available on the market and will outperform custom orthotics. VOXX Human Performance technology (HPT) is based on 45 Years of research in Neuromuscular Science, Chiropractic Neurology and Reflexology. VOXX HPT is a very specific sequence and pattern of neuroreceptor activation points on the bottom of the feet that triggers a signal that aides in the brainstem reaching homeostasis. The neurostimulation starts by triggering neural responses in the receptors on the bottom of your feet. This information travels through the nervous system to reach the brainstem and the brain. These commands are then sent to the somatic nervous system (Part of the peripheral nervous system responsible for movement of voluntary muscles) and the autonomic nervous system (Controls automatic functions like heart rate, digestion, respiratory rate) where they trigger various responses in the body. Together these two systems have a beneficial impact on things like pain management, balance, spatial orientation, motor control, heart rate regulation and energy. 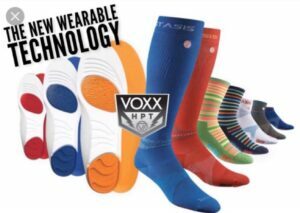 By stimulating the nervous system VOXX socks and insoles are able to unlock the body’s potential and instantly change the way people feel and move. Athletes are able to spend less time with preparing and warming up and more time developing strength, power and sports specific skills needed for them to play their best. When I first heard about these products I was giving a presentation at a conference in Barrie for Brain Injury Survivors. Initially, I was very skeptical. But I realized that I was promoting Alternative Treatments and needed to approach ALL potential treatments with an open mind. After the conference I contacted one of the distributors and arranged to meet them in order for me to try the socks. After wearing a pair of VOXXLIFE socks during the night, I felt much more energy and much less pain in my knee the next day. I have had chronic fatigue because of sleep problems that I have experienced since I sustained a Traumatic Brain Injury. I have also lived with severe knee pain because I broke my knee and tore all the ligaments in my knee in my motorcycle accident. So, this improvement in my energy level as well as the reduction in pain got me very interested in VOXXLIFE. NFL players, runners, weight lifters, NHL players, NBA players, pro golfers, MLB players, world’s strongest man – Nick Best, Olympic athletes, brain injury survivors, stroke patients, MS sufferers, people with diabetes, physiotherapists, chiropractors, reflexologists, personal trainers, people suffering from neuropathy, seniors who want an improvement with their balance, people who just want more strength, more endurance, and a better range of motion. If you are experiencing any kind of foot/leg/back pain, it wouldn’t hurt you to try these socks and insoles. To make it even more attractive, the company offers and 30 DAY MONEY BACK GUARANTEE if you are not satisfied. Please make sure you see my name (Anthony Aquan-Assee) and my picture at the top corner to make sure the site is legitimate. Namaste to your health and peace.